We rarely eat marmalade and jams but I love making them. Have already made and posted a recipe of microwave cooked orange, lime and grapefruit marmalade before. This time I made it in a pan so the recipe is clear to a few friends who requested. 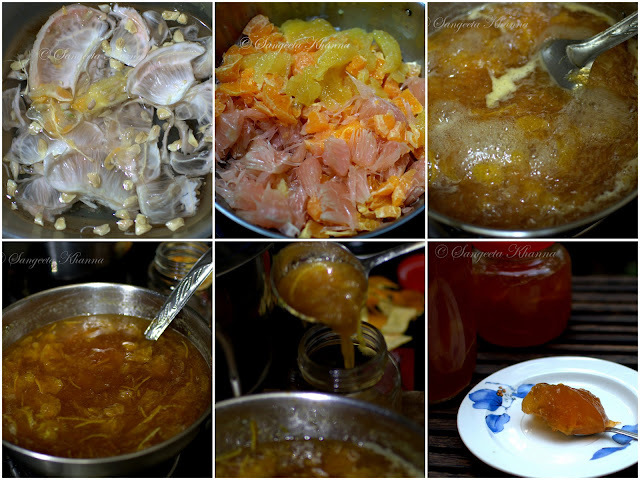 The right consistency when the marmalade is ready to be bottled and the extraction of pectin from the seeds and white pith is something that can intimidate someone who is making marmalade for the first time. I hope all those fears will be overcome after this post and a jar will be made in your kitchen as well. 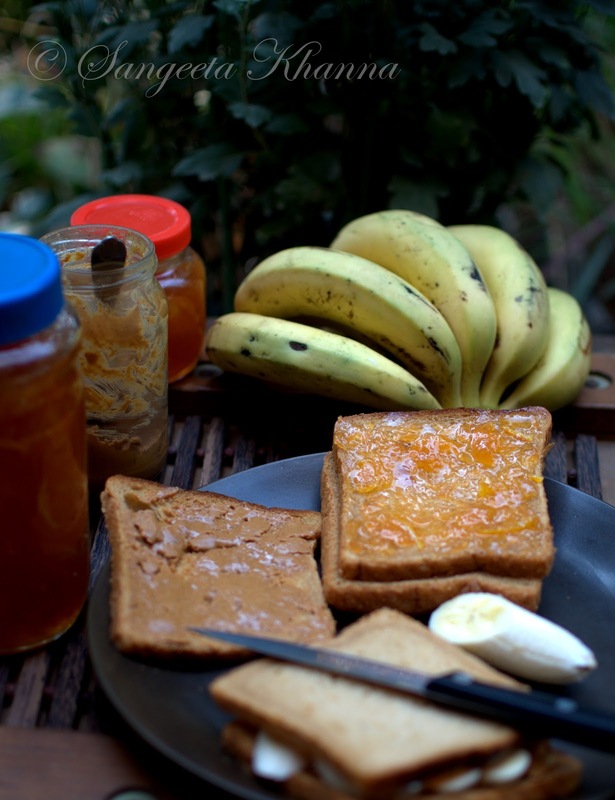 Marmalade and jams are much loved all around the world as the fruit flavor gets intensified in a preserve that can be used to glaze cakes and muffins or for an occasional fruit sandwich that we enjoy. Sometimes I add my citrus fruit marmalade to the cake batter after mixing so the marmalade stays in lumps mimicking fruit. Also a little orange marmalade over fried chicken breasts with soy and a few Chinese spice powders is a great way to enjoy the fruity preserve. This season I made marmalade in two batches. One was made at a friend's place and another batch at home, as usual a night time cooking spree for me. A pan full of marmalade was cooked and bottled. The next day our home was to be whitewashed so a small jar of this was used to make fruit sandwiches too. 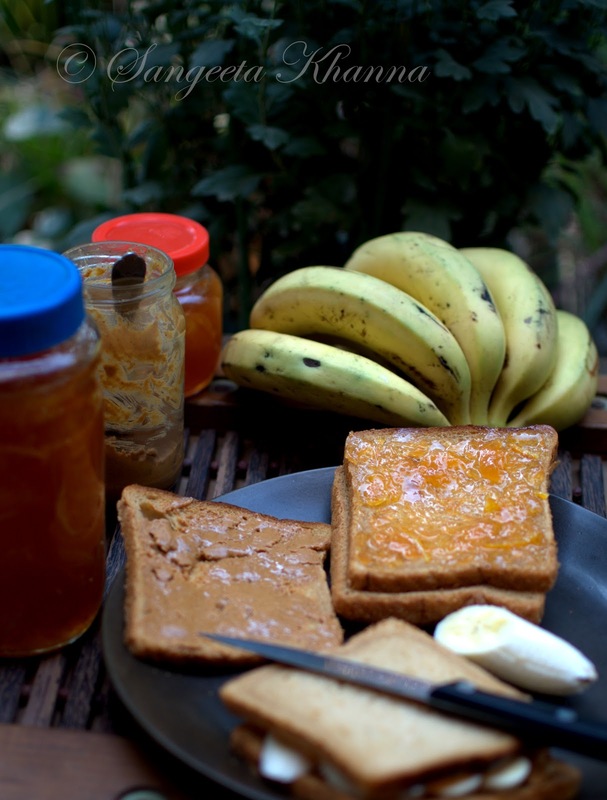 Peanut butter, orange marmalade and banana sandwiches to be precise. I made this collage (below) so the cooking procedure is clear in one go. First we separate the fruit parts. The seeds and the white pith and parchment like skin of each segment is saved as you see in the first picture. Seeds of grapefruit have a lot of pectin so it's always a good idea to use them while making marmalade or jamming any fruit that does not have it's own pectin. To a packed cup of skin and seeds add 2 cups of water and cook either in a pan (gently simmered for about 15 minutes) or in pressure cooker (till the first whistle) or in microwave for about 10 minutes with a few 2 minute breaks. The water appears clear but gummy after cooking as the pectin gets extracted from the seeds and skin. This water (the liquid filtrate) is to be used and the solids discarded. You would like to press the solids hard against a sieve so the thick jelly like solution gets extracted in the last. Now this solution is to be added to the cleaned segments of fruit. I used a mix of Sweet lime, Grapefruit and Oranges(see pictures above). About 1/4 cup of orange peel chopped into thin strips is added to this mixture. And then the mixture is heated to boil. Once boiling, keep a stirring spatula in the pan all the time and simmer on low flame. The mixture bubbles, froths a little and thickens a little. It needs cooking for about 40 minutes to an hour on low flame (depending on the water content of fruit, added water etc etc). Just when you see the mixture turning shiny and translucent and the syrup does not spread and dissolve when dropped into a bowl of water, it is ready to be bottled. Or if you drop the cooked mixture from the spatula, it leaves a trail of two strings in the last. Another way to test a cooked marmalade is to take out 2 spoonfuls into a flat bowl and cool it slightly, a thin translucent film will start forming on the surface indicating the marmalade is done. Keep sterilised bottles handy and pour the cooked liquid in them, it sets into gorgeous marmalade as it cools down. Are you a marmalade lover as well? How do you like your marmalade? It's fun to make such preserves when you are accompanied with a friend or family members, you keep chatting and soaking in the wafting citrus aromas and a couple of jars of marmalade are ready in a jiffy. just loved the way you made the marmalade without adding any pectin or artificial preservatives. Make some. Even 2 oranges give a nice bottle full of marmalade. Glad you liked it Priya. Thank you. bookmarking this. So far I stayed away from making these jams and preserves because I didnt want the "jhanjhat" of preservatives etc.. but this seems like such a cool idea. Will try this one! Have a query hence this comment today. 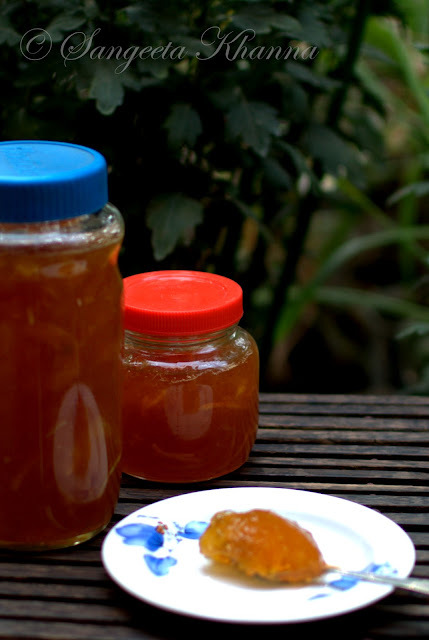 Is it advisable to use jaggery or honey instead of sugar in the jam making process above? Will it affect the taste or durability? I couldn't think of a better person to ask this question. Haven't come across a single jam recipe on the internet without using sugar. And my hands are itching to make an apple jam tomorrow :-) Please let me know if possible otherwise I will go ahead with the sugar I guess. Also, I will have to use lime juice in case of apple jam right? 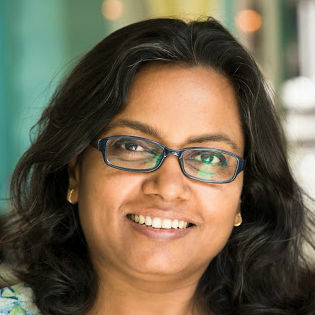 Thanks Kalyani for the sweet words. 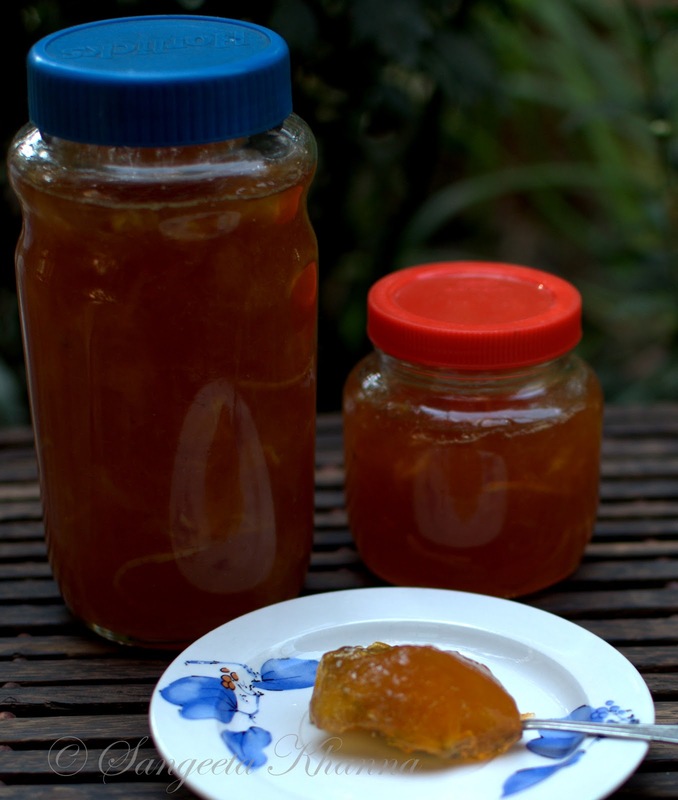 For jams and jellies or marmalade 'to set' you need sugar and pectic both as the reaction between the two cause the pectin to gel at room temperature. Most fruits have enough pectin and we add sugar while cooking so the setting happens. Although for apples you can cook them without sugar and call it apple butter, it wont set like jam but will taste great eve without sugar. Add cinnamon or other spices you like. And you can make fruit preserves with honey or raw sugar (jaggery etc) but that wont set, and wont be preserved well. Do that if you can refrigerate the fruit preserve.